Exclusive - Red Chalk is back plus 10 per cent off! Exclusive – Red Chalk is back plus 10 per cent off! After a three-year hiatus, Red Chalk is back and hipper than ever! Designer Kate Perry is back in the designer saddle with new products, a new website and a new (and super sweet) Red Chalk team member, eighteen-month-old daughter Olive. 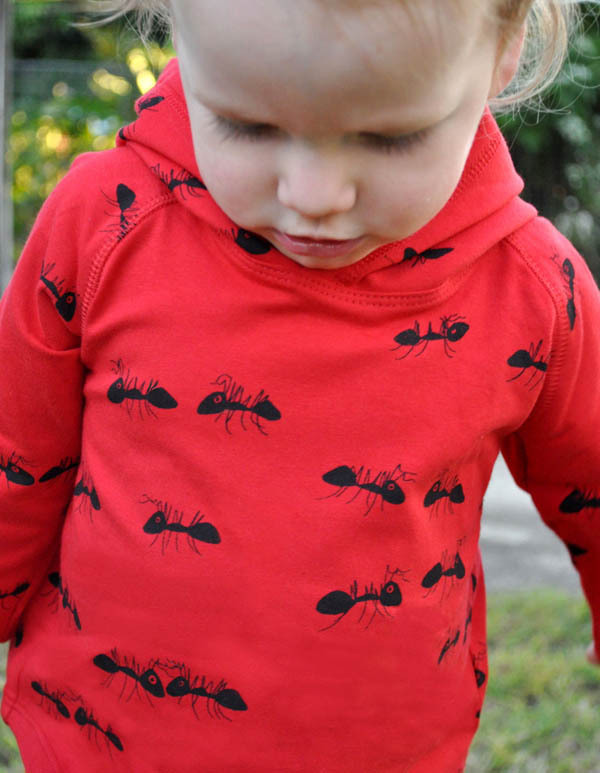 The virtual aisles of Red Chalk are packed full of kids clothes that kids themselves will be thrilled to wear – it’s here you’ll find fun and quirky prints including ant colonies, hungry echidnas and even the next door’s cat – and they’re on everything. Well maybe not everything per se but definitely jumpers, jumpsuits, dresses, leggings, long sleeve tops and nappy covers, just to name a few. Bright colours are bountiful, with pumpkin orange and red paired beautifully with bold black and white nursery rhyme newsprint. Red Chalk’s infant ant jumpsuits ($69) are simply divine with their grey fabric, ant print and bold coloured trim. For older children, I absolutely love the pumpkin coloured ant print leggings ($30) – perfect for slipping on after swimming lessons or for lounging around in after school. And every piece is made right here in Australia. To see all of Kate’s new wares, head on over to Red Chalk, where Kate is only to happy to post all over Australia! Especially for Babyology readers, Red Chalk is offering 10 per cent off sitewide with code ‘babyology’ – the offer ends 8pm 12 July so get in quick to make an order in that window of time!